"Queen Beatrice" and "Queen Beatrix" redirect here. For other uses, see Queen Beatrice (disambiguation). Beatrix  (Beatrix Wilhelmina Armgard, Dutch pronunciation: [ˈbeːjaːtrɪks ˌʋɪlɦɛlˈminaː ˈʔɑrmɡɑrt] ( listen ); born 31 January 1938) is a member of the Dutch royal family who reigned as Queen of the Netherlands from 30 April 1980 until her abdication on 30 April 2013. Beatrix is the eldest daughter of Queen Juliana and her husband, Prince Bernhard of Lippe-Biesterfeld. Upon her mother's accession in 1948, she became heir presumptive. Beatrix attended a public primary school in Canada during World War II, and then finished her primary and secondary education in the Netherlands in the post-war period. In 1961, she received her law degree from Leiden University. In 1966, Beatrix married Claus von Amsberg, a German diplomat, with whom she had three children. When her mother abdicated on 30 April 1980, Beatrix succeeded her as queen. 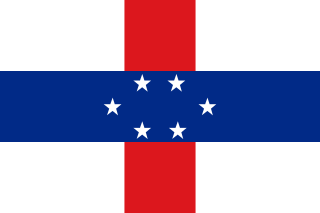 Beatrix's reign saw the country's Caribbean possessions reshaped with Aruba's secession and becoming its own constituent country within the Kingdom in 1986 as well as the subsequent Antillean Dissolution in 2010, which created the new special municipalities of Bonaire, Sint Eustatius, and Saba, and the two new constituent countries of Curaçao and Sint Maarten. 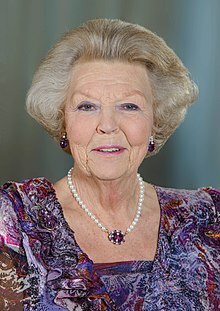 Beatrix was born Princess Beatrix Wilhelmina Armgard of the Netherlands, Princess of Orange-Nassau, Princess of Lippe-Biesterfeld, on 31 January 1938 at the Soestdijk Palace in Baarn, Netherlands. She is the first child of Princess Juliana of the Netherlands and German aristocrat Prince Bernhard of Lippe-Biesterfeld. Beatrix was baptized on 12 May 1938 in the Great Church in The Hague. Her five godparents were King Leopold III of Belgium; Princess Alice, Countess of Athlone; Elisabeth, Princess of Erbach-Schönberg; Duke Adolf Friedrich of Mecklenburg; and Countess Allene de Kotzebue. Beatrix's middle names are the first names of her maternal grandmother, the then reigning Queen Wilhelmina, and her paternal grandmother, Armgard of Sierstorpff-Cramm. World War II broke out in the Netherlands on 10 May 1940 (Westfeldzug). On 13 May, the Dutch Royal Family evacuated to London, United Kingdom. One month later, Beatrix went to Ottawa, Ontario, Canada, with her mother Juliana and her sister Irene, while her father Bernhard and maternal grandmother Queen Wilhelmina remained in London. The family lived at the Stornoway residence (now the residence of the Leader of the Opposition in the Parliament of Canada). With bodyguards and ladies in waiting, the family summered at Bigwin Inn on Lake of Bays, Ontario where four private stone cottages of the resort served as their retreat. While on Bigwin Island, the constitution of the Netherlands was stored in the safe of Bigwin Inn's Rotunda building. Princess Juliana and her Family were remembered for their "down to earth" friendliness, general gratefulness and great reverence for their homeland and people, to whom they paid homage by refraining from all luxuries offered to guests at the resort that was once billed as the largest and most luxurious summer resort in Canada. In order to provide them with a greater sense of security, culinary chefs and staff catered to personal orders at meal time. Upon their departure, the hotel musicians of the Bigwin Inn Orchestra assembled dockside; and at every public performance afterward through to the end of World War II, the Wilhelmus was played. In the years following the shuttering and neglect of the island resort, the "Juliana" cottages were well maintained and preserved in an informal tribute to Princess Juliana and her family. In thanks for the protection of her and her daughters, Princess Juliana established the custom of the delivery to the Canadian government every spring of tulips, which are the centrepiece of the Canadian Tulip Festival. On 5 May 1945, the German troops in the Netherlands surrendered. 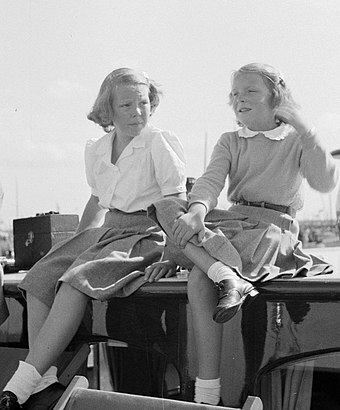 The family returned to the Netherlands on 2 August 1945. Beatrix went to the progressive primary school De Werkplaats in Bilthoven. Her third sister Princess Christina was born in 1947. On 6 September 1948, her mother Juliana succeeded her grandmother Wilhelmina as Queen of the Netherlands, and Beatrix became the heiress presumptive to the throne of the Netherlands at the age of ten. Her appearance on the political scene was almost immediately marked by controversy. In 1965, Princess Beatrix became engaged to the German aristocrat Claus von Amsberg, a diplomat working for the German Foreign Office. There was a massive protest on their wedding day in Amsterdam on 10 March 1966. Prince Claus had served in the Hitler Youth and the Wehrmacht and was therefore associated by some of the Dutch population with German Nazism. Protests included such memorable slogans as "Claus 'raus!" (Claus out!) and "Mijn fiets terug" ("Return my bicycle" – a reference to occupying German soldiers confiscating Dutch bicycles during WWII). A group of Provos threw a smoke bomb at the Golden Coach, resulting in a violent street battle with the police. But as time went on, Prince Claus became one of the most popular members of the Dutch monarchy, and his death in 2002 was widely mourned. 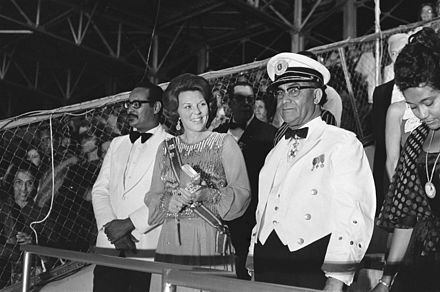 On 25 November 1975, Beatrix and Prince Claus attended the independence ceremony of Suriname, held in the new nation's capital, Paramaribo, representating her mother, the Queen. There was an even more violent riot on 30 April 1980, during the investiture (sovereigns of the Netherlands are not crowned as such) of Queen Beatrix. Some people, including socialist squatters, used the occasion to protest against poor housing conditions in the Netherlands and against the monarchy in general, using the slogan "Geen woning; geen Kroning" (No home, no coronation). There were violent clashes with the police and security forces. This event is reflected in contemporary Dutch literature in the books of A.F.Th. van der Heijden. As monarch, Beatrix had weekly meetings with the prime minister. She signed all new Acts of Parliament and royal decrees, and until a constitutional change late in her reign, appointed the informateur , an official who is responsible for chairing coalition talks in the formation of new governments. At the state opening of parliament each September, she delivered the Speech from the Throne, in which the government announces its plans for the coming parliamentary year. As Queen, she was president of the Council of State. Her role was largely ceremonial and as a focus of national unity; she did not make legislative or executive decisions. Beatrix is a member of the Bilderberg Group,  a secretive, invitation-only annual conference co-founded by her father which first met in Hotel de Bilderberg in Oosterbeek. On 28 June 1965, the engagement of Princess Beatrix to the German diplomat Claus von Amsberg was announced. Claus and Beatrix had met at the wedding-eve party of Princess Tatjana of Sayn-Wittgenstein-Berleburg and Moritz, Landgrave of Hesse, in summer 1964. Following the consent of Parliament to the marriage, Claus von Amsberg became a Dutch citizen, and upon his marriage became Prince Claus of the Netherlands, Jonkheer van Amsberg. The royal couple lived at Drakensteyn Castle in Lage Vuursche with their children until Beatrix ascended the throne. In 1981, they moved into Huis ten Bosch Palace in The Hague. On 30 April 1980, Beatrix became the monarch when her mother abdicated. She was sworn-in and inaugurated as monarch during a joint session of the two chambers of the States General at a ceremony held in the Nieuwe Kerk in Amsterdam later that day. Beatrix's constitutional duties included those typically accorded to a head of state; this includes having to sign every piece of legislation before it becomes law, formally appointing various officials, receiving and accrediting ambassadors, and awarding honours and medals, among others. Outside of these constitutional duties, her other informal roles included being the highest representative of the kingdom internationally and to be a unifying figure locally. Beatrix was rarely quoted directly in the press during her reign since the government information service (Rijksvoorlichtingsdienst) made it a condition of interviews that she may not be quoted. This policy was introduced shortly after her inauguration, reportedly to protect her from political complications that may arise from "off-the-cuff" remarks. It did not apply to her son Prince Willem-Alexander. Throughout much of her reign Beatrix had a considerable role in the cabinet formation process; notably she appointed the informateur , the person who leads the negotiations that ultimately lead to the formation of a government. However, this was changed in 2012, and now the largest party in the States General appoints a "scout" who then appoints an informateur. On 1 January 1986, Aruba seceded from the Netherlands Antilles and became a separate constituent country in the Dutch Kingdom. On 6 October 2002, the Queen's husband, Prince Claus, died after a long illness. A year and a half later her mother died after long suffering from senile dementia, while her father succumbed to cancer in December 2004. On 29 and 30 April 2005, she celebrated the 25th anniversary of her reign. She was interviewed on Dutch television, was offered a concert on Dam Square in Amsterdam, and a celebration took place in The Hague, the country's seat of government. On 10 October 2010, the Netherlands Antilles were formally dissolved. 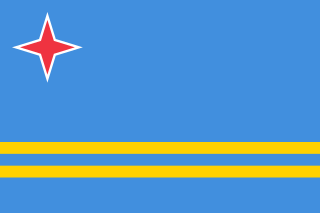 The new municipalities of Bonaire, Sint Eustatius, and Saba and the new constituent countries of Curaçao and Sint Maarten were established in its place. The dissolution ceremony in the Netherlands Antilles' capital, Willemstad, was attended by the then-Prince and Princess of Orange, Willem-Alexander and his wife Máxima, representing the Queen. Queen Beatrix International Airport in Aruba. Beatrixpark in the Oud-Zuid neighbourhood in Amsterdam. Beatrix has received honours and awards from countries around the world, both during her life as a princess and as a monarch. In her capacity as the Sovereign she was Grand Master of the Military Order of William (Militaire Willemsorde) and the other Dutch orders of merit. She is a Stranger Lady of the Most Noble Order of the Garter and the 1,187th Dame of the Order of the Golden Fleece in Spain, and she has received numerous other medals and decorations. 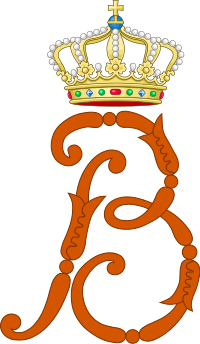 As Queen of the Netherlands (1980–2013), Beatrix used the Greater Coat of Arms of the Realm (or "Grote Rijkswapen"). As Princess, Beatrix used a square and swallow tailed flag, with the Royal standard colours and their maternal arms (the horn of Orange) in the upper hoist and their paternal arms (the rose of Lippe) in the lower hoist. The arms of the Netherlands (which originates from Nassau) without the insignia of the Order of Willem within an orange circle. 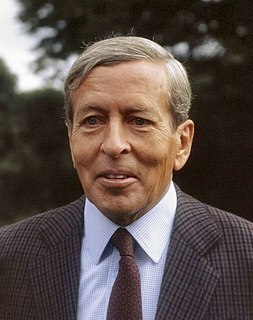 Prince Claus of the Netherlands, Jonkheer van Amsberg, was the husband of Queen Beatrix, and the Prince Consort of the Netherlands from Beatrix's ascension in 1980 until his death from Parkinson's disease and heart and respiratory ailments in 2002. Catharina-Amalia, Princess of Orange is the heir apparent to the throne of the Kingdom of the Netherlands, consisting of the countries of the Netherlands, Curaçao, Aruba, and Sint Maarten. 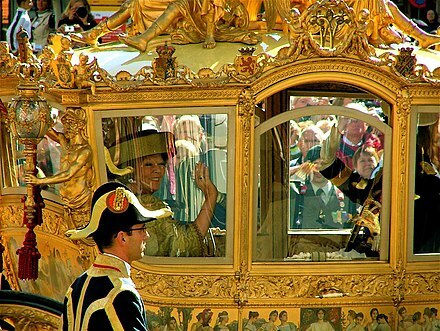 The Golden Coach is a coach owned and used by the Dutch royal family. The Gold Coach is used every year to carry the Dutch monarch from the Noordeinde Palace to the Ridderzaal in order to deliver the Speech from the Throne. Lippe-Biesterfeld was a countly cadet line of the House of Lippe between 1762 and 1905. In 1916, a new, Princely, cadet line was created for the wife and sons of Prince Bernhard of Lippe. It also became a title of the Dutch Royal House created in 1937. Armgard von Cramm was the mother of Prince Bernhard of Lippe-Biesterfeld, Prince consort of Queen Juliana of the Netherlands. ↑ de Jong, Perro (30 April 2013). "The Netherlands' love and respect for Beatrix". BBC. Retrieved 5 June 2015. ↑ Myrtille van Bommel, "Beatrix oldest Dutch reigning monarch Archived 3 November 2013 at the Wayback Machine ", Radio Netherlands Worldwide , 2011. Retrieved on 2012-05-15. 1 2 3 4 5 Youth Archived 5 May 2009 at the Wayback Machine . The Dutch Royal House. Retrieved on 2008-07-11. ↑ (in Dutch) Geschiedenis, Grote Kerk Den Haag. Retrieved on 2012-05-15. ↑ "CBC News". Cbc.ca. 18 January 2008. Retrieved 2010-03-05. ↑ Education Archived 5 May 2009 at the Wayback Machine . The Dutch Royal House. Retrieved on 2008-07-11. ↑ Davison, Janet. "Abdicating Dutch queen was a wartime Ottawa schoolgirl". CBC.ca. Canadian Broadcasting Corporation . Retrieved 29 April 2013. ↑ "National Capital Commission". Canadascapital.gc.ca. Archived from the original on 13 October 2009. Retrieved 2010-03-05. 1 2 3 "Het Koninklijk Huis". Koninklijkhuis.nl. Archived from the original on 25 February 2010. Retrieved 5 March 2010. ↑ "e_CV_Reine_Beatrix". www.coe.int. Retrieved 2017-01-20. ↑ "Bilderberg Meeting of 1997 Assembles". PR Newswire. 13 June 1997. Archived from the original on 30 April 2011. ↑ "Wedding of Princess Beatrix and Claus von Amsberg". Amsterdam Palace. Archived from the original on 17 April 2016. ↑ "Queen Beatrix: marriage and family". Dutch Royal House. Archived from the original on 26 June 2012. ↑ "Chapter 8. The process of Polish rehabilitation in 2006". Polish forces in the West. Archived from the original on 5 January 2019. Retrieved 10 January 2016. ↑ NO. "Koninklijke familie was doelwit (Royal family was the target) (Dutch)". Archived from the original on 3 May 2009. Retrieved 1 May 2009. 1 2 "Dutch Queen to abdicate in April for son". Al Jazeera. 28 January 2013. Retrieved 28 January 2013. 1 2 "Queen Beatrix of the Netherlands to abdicate for son". BBC. 28 January 2013. Retrieved 28 January 2013. ↑ "In Pictures: The World's Richest Royals". www.forbes.com. Forbes.com. 30 August 2007. Retrieved 2010-03-05. ↑ (Dutch) Verhuizing Prinses Beatrix, Koninklijk Huis. Retrieved 24 July 2013. ↑ Depictions, text in Dutch Retrieved 23 June 2017. 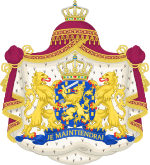 ↑ "The Dutch Royal House; FAQ; "How should I address members of the Royal House?"". Archived from the original on 10 June 2007. Retrieved 2008-06-29. ↑ Van den Bor, Conny (29 April 2010). "Queen Beatrix – still impeccable after 30 years". Radio Netherlands Worldwide. Archived from the original on 11 November 2013. Retrieved 28 January 2013. ↑ "Prins van Oranje wordt Koning Willem-Alexander" (in Dutch). Website of the Royal House. 28 January 2013. Retrieved 28 January 2013. ↑ Aruba received status aparte in 1986. Wikimedia Commons has media related to Beatrix of the Netherlands .